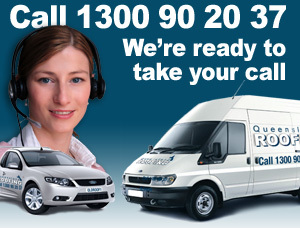 Roof Repairs Tiled Roofs Brisbane, Fixing a leaking roof. As someone that would consider themselves extremely experienced in the area of finding and tracking leaks on roofs in Queensland let me start by saying this. If you are looking for assistance in what direction to take when trying to find the cause of your leaking roof I want to warn you that while some leaks will be relatively easy and open to success by the D.I.Y home handyman, some will be extremely difficult, involved and will most certainly require professional involvement. 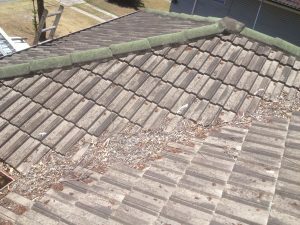 Due to the complexity of leak tracking on different roof styles, I have dedicated this article to the tracking of leaks on tiled roofs and the more common issues that occur on tiled roofs in Brisbane, Logan and the Gold Coast. I have written another article on tracking leaks on a metal roofs so if your roof is metal please refer to that blog. As mentioned the level of difficulty in tracking the leak will have a lot to do with the type of roof you have. A basic four bedroom house with a tiled roof and easy ceiling access can mean light work in relation to leak tracking. However a flat metal roof on a commercial warehouse with no ceiling can mean leak tracking and leak repair can be extremely difficult. I hope that this article my be able to assist you with where to start in tracking the leak on your domestic home with a tile roof. Yes I know it sounds simple but there are many ways in which a tile can be broken and some of them you can’t see from the top. A basic break will break straight down the middle while a break on the under lap of the tile will not be visible from the top. When locating the general area of the leak of possible pull out half a dozen tiles and see if you can line up the tile or tiles you think are a problem with the water damage in the ceiling. If you are not confident in pulling tiles out them see if you can track the leak from the inside by climbing in through the manhole. Observations over time have confirmed for me that this is a very misunderstood area of tiles roofs. Just because some of the old concrete is showing cracks doesn’t mean that they are the cause of the leaks. Please don’t go filling up cracks with silicone. While loose caps can lead to leaks, and do need maintenance, the most common problem we see is actual lack of proper drainage or what the roofing industry calls ‘weep holes’. Lack of ‘weep holes’ is the main cause of leaks along the ridge line of leaking tiled roofs. If you have on or more circular patches on your ceiling this could be a sign that you have leaking clips. This is a particular problem that requires special attention and special discussion. In a nutshell the hooks that are holding your tiles down are causing a blockage in water flow between your tiles. It can be brought on with dirt build up between the tiles but can also occur with no build up between the tiles at all. As mentioned it requires special attention so please call Queensland Roofing if you feel the cause might be the leaking clips. 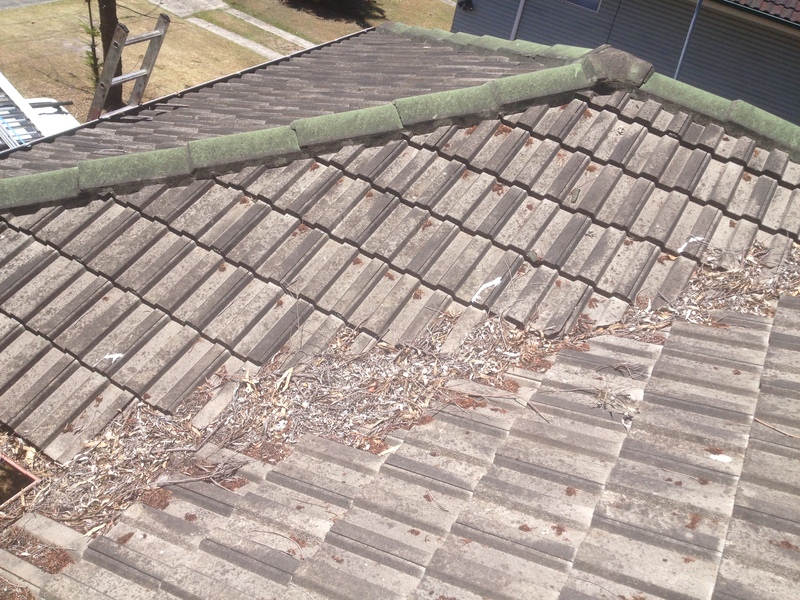 A very common and easy to fix issue with leaking tiled roofs in Brisbane Logan and the Gold Coast is debris from trees blocking the flow of water down the valleys. Blocked valleys can lead to quite severe leaks as the valleys are designed to carry quite a lot of water off your roof and into your gutters, so to block them can mean large amounts of water backing up and over flowing from the valleys into your house. Roof Repairs on blocked valleys can sometimes mean big clean ups. If your tiled roof has rusted valleys then all you need is heavy rains for extended periods and a hole the size of a pin head cause start causing you problems. The reason is because the amount of water that is directed from the roof to the valleys and the fact that during heavy rain the valleys do not get a rest and a holding water the entire time. Like there close brother ‘your gutters’ valleys are designed to hold water and therefore the smallest hole in them will most certainly start to leak. For more information check out our video about Valley Repairs.